After pulling $34B from US stock funds during the first two weeks of August, the hit parade continued last week with another $3.2B pulled. Not to mention another $610M removed from foreign equity funds for the week ending Aug 24. Note how the SP500 bottomed right in the middle of the frantic selling by retail investors. Now as the market pushes higher throughout August retail investors are still skittish. They are always a great contraian indicator. After recent Q2 earnings reports, the market was impressed with the talk from Home Depot (HD) management and disappointed with Lowe's (LOW). According to most analysts including Mad Money host Jim Cramer, HD is winning the home improvement market. Click here to see the video where Cramer breaks down the two companies. It's very difficult to argue with Cramer or any other Wall Street experts. Sure investors can spends hours researching the stores, but ultimately both are great companies. Consumers tend to shop at the closest store and HD is restructuring so the better results at HD might just be a bounce back from lackluster results previously. Disclosure: Long HD and LOW in client and personal accounts. Please review the disclaimer page for more details. Today Lockheed Martin (LMT) announced an additional $1B stock buyback on top of the current $3B authorization that is expected to reach its limit soon. While the news appears good, market analysts have lately become very bearish on stock buybacks. See interview of Joshua Brown from Fusion Analytics. Note though he claims Cisco Systems (CSCO) is the worst in issuing new shares, the latest quarterly report shows a nearly 300M share drop from last year - 5,795M to 5,496M shares. The key points missing from this interview is that investors naturally want to focus on companies that actually follow through on the announcement and ones that have net buybacks, ones that reduce the outstanding shares rather than just replacing the stock option issuance. Disclosure: Long CSCO and LMT in Net Payout Yield modle. Please review the disclaimer page for more details. Since a picture is worth a thousand words, thought we'd start throwing in some graphs on the Net Payout Yield stocks. Travelers (TRV) has had one of the highest NPY's over the last year with the massive buyout they've undertaken. The below chart shows the quarterly combined dividends and buyback percentages based on the current market cap of $21.7B. Note the Q2 2011 buyback dropped substantially due to the tornado related losses in the US. Add up the last four quarters gives a NPY of roughly 17%. Incredible how little attention the NPYs obtain these days. All the focus is on dividends. Imagine a SP500 stock with a 7% quarterly dividend like TRV posted in Q4 and than again almost in Q2 2010 as well. Disclosure: Long TRV in client and personal accounts. Please review the disclaimer page for more information. July was a negative month for the Net Payout Yields model on a relative basis. The model underperformed the S&P 500 by 0.36%, with a loss of 2.5% versus the 2.15% loss for the benchmark (Covestor calculations). On a three month basis, the model has outperformed nicely during a very weak period in the market. It outperformed the S&P 500 by 1.45%, with a loss of 3.78% versus the 5.23% loss for the benchmark (Covestor calculations). The model sold Boeing (BA) and bought Travelers (TRV) and Campbell Soup (CPB). As always, the moves are triggered by the decreases or increases in the Net Payout Yield of each stock with a bias towards limiting trades so stocks are not immediately removed or added based on a top 20 yielding list. BA has a decent 2.7% dividend yield, but recently has eliminated buybacks. With normal yields in the model consistently adding up to greater than 10%, BA no longer fits into the requirements. Poll of the Day: Should Obama Cancel His August Vacation? Note: Main computer was without connection to the internet last week so I'm just now getting back to being able to post. Interest poll results from CNBC on whether Obama should cancel his vacation due to the markets and economy or take it anyway. Surprised to see that 47% said he should cancel his vacation. Considering he tends to spook the market when he speaks wouldn't it be nice to go a week without his constant bashing of the wealthy? Of course, 53% of the voters want him to go on vacation or said it doesn't matter so maybe that's a sign that investors think the market would be better with him gone. At least a signal that him being at work sure doesn't help. Should President Obama Cancel His August Vacation? After the close today, Hartford Financial (HIG) reported earnings basically in line with expectations following the tornado disasters in the US during Q2. More importantly though, HIG announced plans for a $500M share buyback equalling 5% of their current market cap of $10B. This always begs the question of why the stocks of insurers such as HIG and Lincoln National (LNC) remain so weak. Both stocks are solid position in our portfolios since they have consistently strong earnings and trade below book value. HIG trades at a PE of sub 6. Sure they are a financial, but they don't face the regulatory issues as banks. Based on a quick estimate, the book value per share for HIG would rise by $2 to $45.26 if the complete buyback were completed around the current price of $22.50. Naturally HIG is likely to rebound higher before it gets the opportunity to complete this buyback, but if not 22M shares will be removed from the market. The New York Fed has agreat chartthat I've used in the past that predicts the possibility of a recession over the next year based on the treasury spread between the 10 year bond rate and the 3 month bill rate. The monthly average for July was nearly 3% again suggesting very little odds of a recession. Interesting to see a Chinese Rating Agency downgrade the US sovereign debt rating when the US rating agencies have been unwilling or unable to make such a move. Its clear that the US doesn't deserve the highest credit rating with $14T of debt growing at an alarming rate. Not to mention a government unwilling to make the tough spending cuts. The Dagong Global Credit Rating agency (never hear of them) cut the credit rating to A from A+. Not even sure from the report whether the highest rating for them is AAA as well. Assuming so they had already downgraded the US several levels prior to this move. What is ironic is that Franklin Templeton complained about the Chinese rating agency lacking transparency. Really? What about lack of accuracy by the big three firms - Moody's, S & P, and Fitch? Not sure why the obsession still exists with agencies proven to lack independence. With the US equity markets down and sharply for 7 and 8 consecutive days depending on the index, Dr. Copper spent the start of yesterday in record territory above $4.5. Outside a week in February, the initial trading yesterday equaled the highest prices in history signaling a very bullish global economy. Sure the BHP mine in Chile that is the largest mine in the world has been shut down by a strike for 12 days now, but I doubt that would matter if global demand was about to slump? Definitely worth watching the rest of the week. 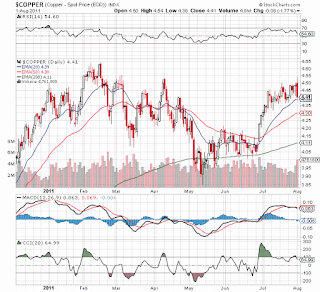 The equity markets are extremely oversold and any bounce in them could spring copper to all time highs above $4.6. Can copper hit record highs with the US heading into a recession and China facing a hard landing? Widely followed technical analyst Carter Worth of Oppenheimer was on Fast Money last night. He has consistently for awhile now been bullish on a breakout of the market once the current range is broken. The major reason is that the market spent 7 months in this range back in 2008 before finally breaking down. Now the market has spent nearly 7 months in the same range and the normal outcome would be the opposite of the last time it spent time in this range. Logically it makes sense that numerous funds are exciting positions that they have held for the last 3 years. 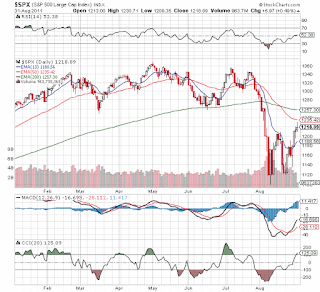 Once they are done and the market breaks out or down the move will likely be strong.